The Union Line's German was built by Harland & Wolff, Belfast. Launched in August 1898, she entered Union's intermediate service between Southampton and South Africa in November of the same year. 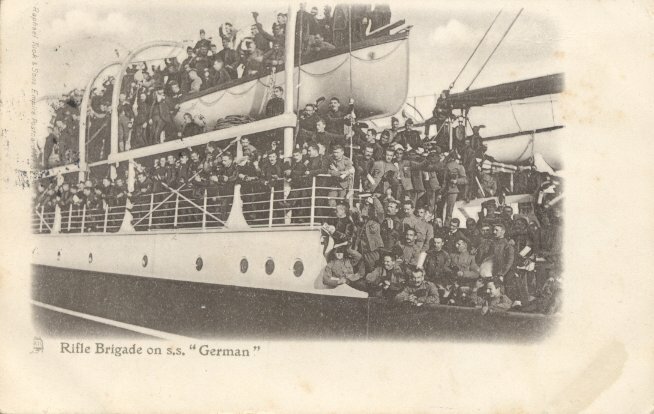 The merger which created Union-Castle took place in March 1900, and German remained on the new line's intermediate service, also being used for Boer War troop transportation. In August 1914, German was given the politically more palatable name Glengorm Castle. During the war she served as a 423 bed hospital ship, and after being decommissioned in in 1921, remained in Government service as a troopship until 1925, except for one commercial sailing for her owner in 1921. When Glengorm Castle returned to commercial service, it was again as an intermediate steamer. By 1929 she had become the final survivor of the Castle Line's ten "G" ships of 1893-1900. She was scrapped in 1930. Sources: Haws' Merchant Fleets; Mallett's The Union-Castle Line; Dunn's Ships of the Union-Castle Line.